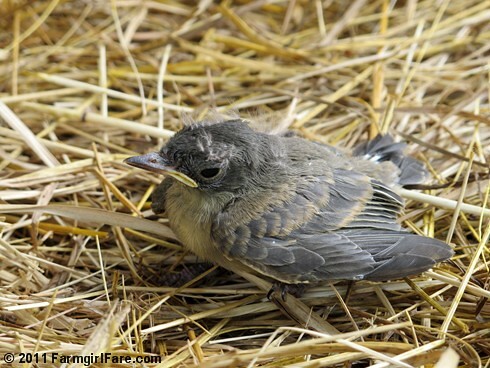 Early Friday afternoon I was walking across the farmyard over to the new house (that would be the one with the newly installed air conditioning system that has already temporarily gone kaput) and found a baby bird sitting in the grass. And then I found a second one. And then I noticed the frantic mother bird swooping around and chirping up a fit. More photos and The Whole Picture below. . . Thanks to my correspondence last spring with wild bird expert Suzie Gilbert, who wrote the heartwarming and hilarious book Flyaway: How a Wild Bird Rehabber Sought Adventure and Found Her Wings, I knew they were phoebes, just like the ones that return each spring to their nest up in the rafters of the sheep barn. You can see photos of the sheep barn phoebes going from eggs to adolescents in my rave review of Flyaway. These babies were pretty good sized, but the mother's anxiety had me wondering if they'd fallen out of the nest, or if flying lesson #1 had ended badly. 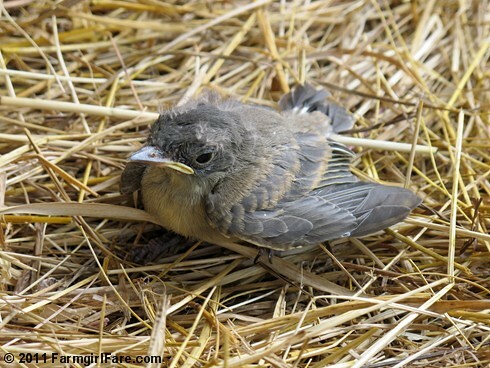 I've come across baby phoebes on the floor of the sheep barn before, and even though I really don't like being on ladders, I did my birdly duty and returned them to their nest. Unfortunately I couldn't find this nest, so I carefully set the two babies on a bale of hay, where I figured they'd be a little more safe. And then in the midst of the whole air-conditioning crisis (moving day has been postponed once again! ), I forgot about them for a while. When I checked back later that afternoon they had both disappeared. The next day I found the larger of the two baby birds back on the ground in the farmyard, with the mother as stressed out as ever. I again placed the baby on a hay bale, and then I set up some extra security. The mother flew up onto a haybarn rafter and stopped chirping. I'm not sure if she felt a little better or was too freaked out to speak. Probably the latter. But at least I knew that baby bird was very, very safe. Lucky Buddy Bear loves babies—no matter what kind they are. Love wild critters and creatures? © FarmgirlFare.com, where building a house—especially one that's located in the middle of nowhere and has been under construction for 8 years—requires patience, a sense of humor, more money and delays than you ever thought possible, and frequently quoting two classic lines from The Money Pit: "Two more weeks!" and "It's gonna be great!" Ahhhh! They are so sweet! I've got a nest of baby house wrens tucked under our roof overhang here in Nevada and I'm keeping my fingers crossed those damn bluejays won't find them! They were just born this week - can't actually see them, but see the mom and dad feeding them. Your baby birds are cuties!! Good old Buddy Bear to the rescue! 105 degrees, I don't know what your going to do without A/C, Good Luck and take care of yourself. No, NO, NO, oh no. I've been anxious for moving day to come and now delayed again. For some reason I am all wrapped up in this. I live in a small house, I have heat, sometimes I have air conditioning. But I am worried about your moving. Must be that I am a mom and you could be my child so I will worry about you also. Whatever it is, I want you and Joe moved in, more comfortable in all seasons, and baking away in the kitchen. Looks like Lucky Buddy Bear and that little birdie are sizing each other up. What a wonderful picture! Lucky Buddy Bear is a kindred spirit to my dear departed Mr. Smiley Dog - Smiley "raised" every critter which came into our household for 14 wonderful years - just something special about dogs who love baby creatures (and NOT to eat!) Oh my I SO empathize with the long awaited move - has been an incredible saga and DEFINITELY should result in a good book deal for you! BTW - we are always covered UP with Phoebes - one location I've named "the Frantics" - seems they are always in a twitter. Bear is a fantastic boy not to hurt that baby. What a good dog Lucky Buddy Bear is! Hope they get the A/C figured out for you! Oh, how I love that Bear of yours. For many reasons. We'll just add this to the list. Lucky Buddy Bear is definitely the Hero! in this bird tale!! He is such a great dog! Give him a hug and a rub on the head from all of us. I can completely relate to your comments about "The Money Pit". We renovated our old house over a long period of time, and referred to those two great lines, too! (At the time, I didn't think the movie was that funny - I guess because I was living it - but we laugh about it now!! So will you - probably.) Good luck with your a/c problem - I am rooting for you!! This note is to Tina: If you throw out a handful of dry cat food every day where the jays can find it, it gives them high protein to feed their own babies and they'll leave other bird babies alone. I do this for the jays at home and the crows at work. The parents will bring their babies around, too, when they're old enough to fly. I feed them for a month or so after that, then taper off. You and LBB have single handedly (pawedly?) inspired me to wait for the right English Shepard over my years of reading your blog. Since my husband and I moved to the country a month ago (yay! ), we've had the opportunity to adopt a WIDE variety of dogs (blue tick coonhound anyone? )...but I just so want that same type of calm, gentle, intelligent partner that you have! Wow, that is SO sweet! I love how baby birds always look so grumpy. Buddy Bear is too much--just the sweetest! that is something to see....amazing! Adorable beyond words. Buddy Bear is amazing!